It was ladies day at Larry’s Hideaway in Las Vegas on February 25, 2012. 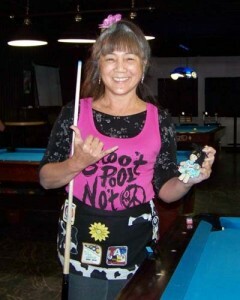 TAP Las Vegas awarded $270 to the ladies of TAP for their excellence in playing pool! The day started with 17 players on 6 beautiful Diamond tables in a double elimination 8-ball tournament. In the end, first place was earned by Marilyn Kamealoha who went undefeated the entire day! In addition to the cash, Marilyn won a place in the Western Women’s Charity Event to be held March 31 at the Rum Runner where she will compete in a 9-ball tournament. Congratulations also to Debbie Evans in 2nd place, to Cindy Chappell in 3rd place, Leslie Weishar in 4th place, Nicole Civetz and Teresa Howard in 5th/6th place. We would like to thank everyone who played and to all of those who helped run the tournament, especially Donna Schwitters who stepped in and took the reins for quite some time. A special thanks to Lisa and her staff at Larry’s Hideaway for the contribution and hospitality. They have one of the best pool rooms in all of Las Vegas featuring 7 Diamond tables in a very spacious room, good food and drinks. This was the first TAP ladies day out and a great time was had by all. The overall consensus was for this tournament to become a regularly scheduled event. Watch for an updated schedule coming soon.